Although less controversial now than it was at the time, I was still surprised to see this moment memorialized as a statue. The more I thought about it, the more it bothered me. First of all, why were the figures standing back to back? That’s not how medalists usually pose. Second, and more important, my favorite part of that image was missing. Where’s that random white guy who’s in hopelessly over his head? Inexplicably, he’s been excised from the scene entirely. Where he would be standing, there’s an empty spot on the podium, as though he’s an embarrassment to the artistry of the moment. That’s never how I’ve seen the image. With the random white guy, it’s real life, which never works out quite so perfectly as you’d planned. Without him, it’s pure iconography. Somewhat disgusted, I came home and researched the statue and the salute itself. I quickly learned that both of my concerns were largely misplaced. Firstly, the positioning. Although it’s hard to tell from the canonical photograph above, Smith and Carlos are standing back to back. They didn’t make their famous gesture until everyone had turned to the American flag during the playing of the national anthem. This image, taken from a different angle, shows that the statue has the positioning exactly correct, even down to the bend in Smith’s legs. 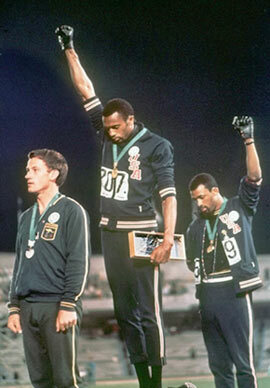 The detailed story frustrated me even more at the omission of Peter Norman, the Australian silver medalist. Far from being the innocent bystander I’d read into the picture, Norman was an integral part. When Carlos forgot his black gloves, Norman suggested that he take Smith's left glove. What’s more, he wore a civil rights badge as a gesture of solidarity. He was ostracized for his actions in Australia, and was left off their 1972 Olympic team for his actions. There can be no doubt that he was part of this moment. He took a stand and paid the price. 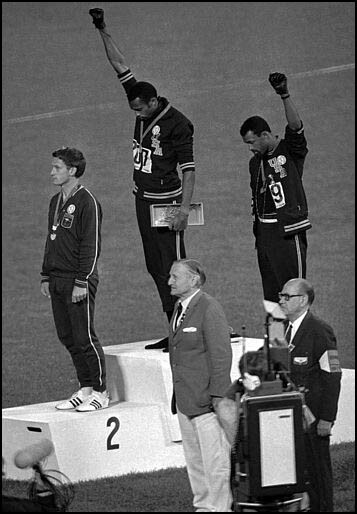 Leaving Peter Norman out of the scene was an enormous insult. And so I felt until I read this fabulous review. Norman’s omission was the single most controversial element of the piece. But it had its purpose. His spot on the podium was left empty so that visitors could stand there to pose for pictures or to lead rallies. And so the imagery comes full cycle. Smith and Carlos created an iconic moment for the cameras. The sculptor turns this moment on its head, making it lend that iconic feel to countless future moments on future cameras. 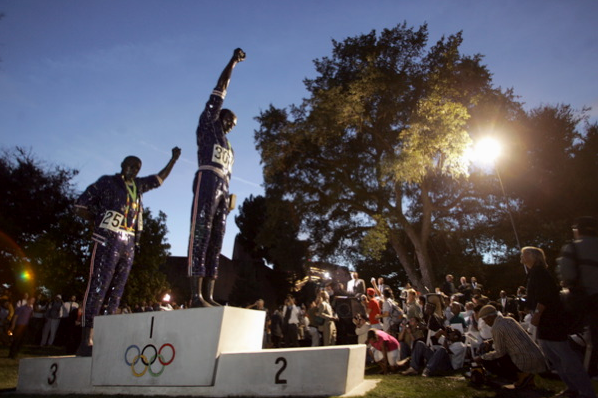 If Peter Norman attended the dedication and gave it his OK, then who am I to criticize? The sculpture is part of the Speed City exhibit in downtown San Jose, which runs through November. It was created by Rico23, a Portuguese artist. This might be my favorite post you’ve made, Dan. Jeez, ya know I don’t really know I found this site, but I saw the picture and read what you had to say. I’d seen the picture before and understood it’s meaning, but as it happened “before my time” I never knew the story behind it. Thank you for the history lesson, explaining the little details and the commentary! What a awesome read. Well looked at from different view points. Peter Norman was a great man who stood up for Aboriginal rights in Australia and he didn’t agree with the “White Australia Policy” which the Australian government enforced at the time. He faced some hard times because of it, but he is always celebrated by the Aboriginal people. Smith and Carlos are also amazing proud people and they seemed to have done something epic. I do not know their impact on the American people first hand. Only from what i read.